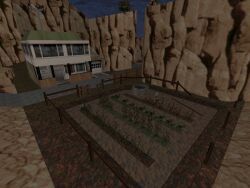 Description: A few years back a new type of gameplay was introduced. 'Red 3' surprised people with its creepy atmosphere and proved that even a Duke3D level can build tension. It has been rumoured that even John Carmack was catched saying "Damn guys - we need to make a game like this" after trying the level - and this led to Doom 3's release last summer. Red 5 picks up where Red 4 ended. The boat you were on came down a waterfall and crashed. The crash site is luckily near the alien-infested EDF headquarters from which a major attack is being planned against the human population. After a small river/canyon section you'll arrive at the abandoned headquarters. This is where the action starts. Creepy voices, scripted sequences, blood-stained ceilings, desperate attempts trying to convince yourself that "this is not happening" - everything that makes this serie so unique is there. You won't encounter aliens the way you normally do. They appear as a result of your actions. This in part helps to build tension and offers a new way to approach the level. It's all well balanced. I died twice as a result of enemy fire and twice because of a trap. 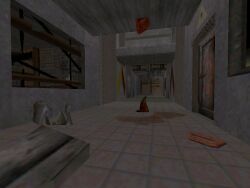 It's not a hard level - just full of surprises and unexpected turns. Gameplay has been spiced up by a bunch of new innovative scripted sequences. I won't spoil them - but I'm telling you that more than once you'll find yourself wondering "how on Earth did he do that?" The abandoned facility has a realistic look. It's full of stuff from tons of different texture combinations to excellent and complex spritework. Some sprites have been turned upside-down, combined or given a new color in order to make something new and fresh. The huge canyon area surrounding the facility looks and feels realistic. I have seen more detailed outdoor areas but Duke's (old) limits made it impossible to add more details. The choice for level's midi works well and the sound usage is fantastic. Anyone who's familiar with Doom 3 knows how you can build atmosphere by just using sounds. Merlijn recommends the level to be played in Classic mode or without Jonof. With Polymost mode the level has a few minor bugs. You should also notice that Polymost also adds some brightness which makes the dark facility appear less dark. Howere I had to run the level with Polymost. Conclusion: "Red 5" is what we expected it to be - an exceptional level. There's hardly anything to complain about and with this innovative gameplay and design the level surely earns its score.